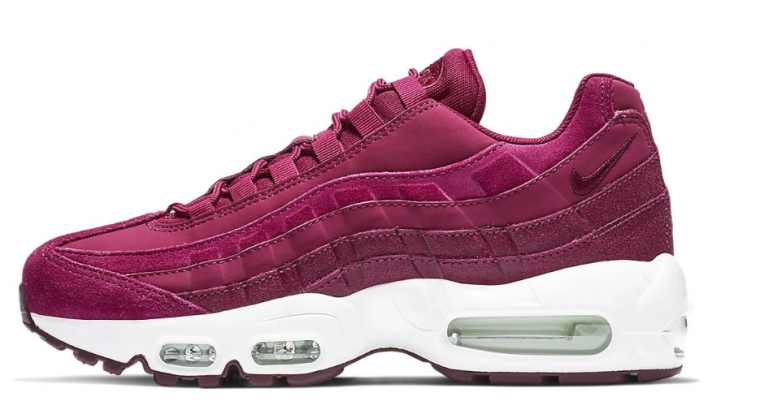 We love a bit of pink over here at The Sole Womens, and these Nike Air Max 95s in True Berry are right up our street. Following a slew of recent pink trainer releases – including the Nike M2K Tekno Pink Plum Chalk, the Pink Reebok Daytonas, and the Pale Pink Puma Cell Enduras – the upcoming Nike release takes the same tack in applying soft feminine hues to a much-loved silhouette. This time around, the waved lines and laces of the AM-95 have been drenched in rich pink tones to create a monochromatic feel. The upper looks to be fashioned from a mixture of brushed suede and leather, and a pink mini Swoosh is embroidered at the back of the outer sidewall. As with most AM95 colourways, the chunky midsole remains a clean white, with a clear Air Max bubble unit visible at the heel and forefoot, finished with a ‘Bordeaux’ outsole. If you’re loving these Nike Air Max 95s in True Berry, make sure you’re locked onto The Sole Womens for their release date and details on where you can grab a pair!